Now that is something you don't see everyday! Well I certainly did not see this one coming! For the most part by this time of year the outdoor boot sales have closed up for the winter. However, in the village there is an indoor version that is held on the last Sunday of each month at the Rayleigh Mill Centre. To be honest it is not great and takes around a half an hour to view the entire thing. I have purchased a couple of things from there over the years but to be honest usually score ‘nil point’ so to speak. That changed in fairly dramatic fashion today though. We were almost finished and about to leave when I noticed a box on the floor by a stall near the exit. It was a picture of an upside down biplane - later identified as a Sopwith Camel - which caught my eye. A closer inspection revealed it to be number 60 of the Aircraft of the Aces part work that was released as a ‘Del Prado/Osprey mash up’ magazine with a 1/100th scale die cast model with each issue and was around 1999 to 2001 (according to the internet of things). You should be able to make out the titles of the volumes in the set - I did not fancy typing all 60 out! I then realised what I was looking at - a complete set of the Aircraft of the Aces part work, sans the models. That is it. All 60 Osprey sized volumes covering aerial combat for WW1 to the Gulf War. £10 or roughly 16.66p each. It doesn't matter which part of the universe you come from - that is a bargain! Each volume is 64 pages and they follow the general Osprey style format so there are lots of colour plates and ideas for paint jobs. If I was being ultra picky I would say there are some notable omissions from the line up - particularly heavy bombers - but this is offset by some titles covering less well known aspects of the air war (Finnish aces anybody?). The main bulk covers WW2 but WW1 has a tidy selection as does more modern air combat starting with Korea. I am very fond of aerial war games and have played many board games over the years on the subject. Starting with Ricthofen's War, Wings and Aces High followed by Air Force, Dauntless (and the expansion kit) and Air War. More recently I have played Axis and Allies: Angels 20 and am also looking at 1/600th for both WW1 and WW2, for which I have a modest amount of kit. All in all the above is a really nice addition to the collection and it will serve to give me much enjoyment when undertaking my aerial adventures. A small selection from my collection of buildings. Note the flat roof types that are equally at home representing Middle Eastern dwellings. My recent return to the Mediterranean and matters Greek related (see my last post for why) have certainly given me some inspiration to get a block game together in some fashion. I was thinking about running a rear guard type of action - initially that covering the retreat to Waterloo - but reckon there is sufficient mileage in the Greek campaign to warrant a good look. It was with this thought in mind that whilst trawling back over some old blog posts (you would be surprised at what I found whilst doing so!) I came across the above picture of my collection of Greek style buildings. I have around a couple of dozen of these of various shapes and sizes and they are usually sold a souvenirs. they are ceramic and glazed but look well enough on the table top. They have served me very well and have featured in many of my games. The great thing about them is that for the most part they have quite a small table footprint. Some of the buildings have also served for any Middle Eastern actions I have fought. Mine have originated from three sources - boot sales, actual souvenirs (I purchased a small number when I was last in Corfu - and will probably do so again when we return there next summer) and as a present (with thanks to Bob Cordery for the latter). I was browsing through Ebay over the weekend when I came across the above title going for a song - so I purchased it! 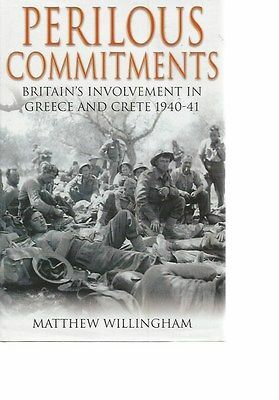 I have long been interested in WW2 in the Mediterranean - more specifically the Greek theatre - and have a number of books about the fighting in the Aegean and of course the airborne invasion of Crete. The above title covers the Crete operation at the end of a sequence of political and diplomatic events that saw British and Commonwealth forces deployed in Greece to fight the Germans. Whilst I am familiar with the Crete and Aegean theatres the early stages of the Greek affair on the mainland are something of a mystery to me so I hope this book will serve to round out my knowledge. From a gaming perspective I consider the whole theatre to be of interest although how I would tackle it I am uncertain of. There is a lot of potential though and so this will be something to look at in the future. H.M.S. 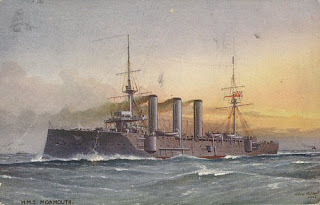 Eurylas of the ill-fated Cressy class of armoured cruisers. She avoided the torpedoing of Aboukir, Hogue and Cressy by having to return to port to recoal. The present time is a very good example of the how the pattern of my wargames have gone since as far back as I can remember. Due to the recent arrival of the 1/2400th scale British and German ships - based on the China Station and East Asia Squadron - my naval wargame thoughts have been placed firmly in the South China Sea. this has been 'helped' by the recent publication of White Bear, Red Sun - a Russo Japanese campaign and tactical rule set by David Manley - and reading Edwin P. Hoyt's book The Fall of Tsingtao. Aside from the above I have also accessed my own memories of the famous WW1 South East Asia naval campaign organised by Eric Knowles after the conclusion of Madasahatta in the late 1970s. this was set in the same area and became a much fought over part of the world - using 1/1200th scale models and a table based variant of the Fletcher Pratt naval rules. An interesting read about the vital part played by the ships of the Red Sea Patrol in supporting the Arab Revolt. This is all fine and dandy but I have, as usual, managed to deviate from what I was originally planning - and I was reminded of this by a quick glance at the bookshelf yesterday evening! 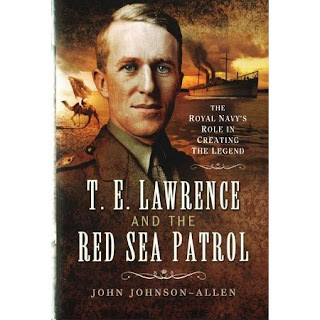 The book in question that served to bring me back to what I should be looking at rather than what I am looking at is of course T. E. Lawrence and the Red Sea Patrol by John Johnson Allen. Now this is not a bad book although their are a couple of errors contained therein. What it does do though is to add the naval dimension to the Arab Revolt - ships of the desert meeting ships of the sea so to speak. The ships of Red Sea Patrol consisted of some old Royal Navy cruisers and vessels from the Royal Indian Marine. My original plan - before getting sidetracked into the South China Sea that is - was to raise some expanded forces for the allies and allow for a larger German presence in East Africa. This ties together two of my favourite campaigns of the Great War - that of Lawrence and of Von Lettow Vorbeck. I have assumed that the main fleet units for both the Royal Navy and the Germans are safely back in home waters glaring at each other across the North Sea so the colonies have to make do with what they can from a naval perspective. This will typically out of date or second line vessels. That is more or less the plan. It means that I can use a great variety of older types and also that the actions will typically be far more manageable in respect of numbers than driving great lines of dreadnoughts about. Firstly though, the models need to be readied. The models I shall be using for my planned 1906 to 1910 'imagi-naval' set up have been sourced from Tumbling Dice and are based on the discount starter packs as follows. This will give me 6 battleships, 6 armoured and 6 protected cruisers and 18 destroyers. All of the above (at least larger than destroyers in size) saw service overseas on a colonial basis. I intend deploying them anywhere from South China to the Red Sea. The Germans then will have 4 battleships, 5 armoured cruisers, 6 light/protected cruisers and 12 destroyers. 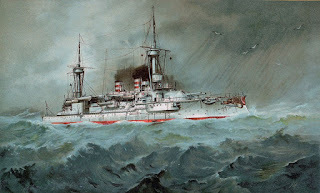 Their fleet has some very old and slow ships alongside the newer cruisers and although the Royal Navy outnumber the Germans in the 1914 East Asia Squadron they possess a modern and powerful force. 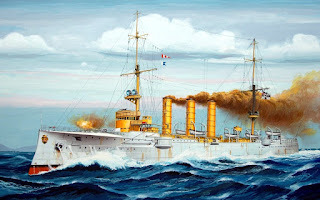 It was for this reason I allowed the Swiftsure and Triumph to head East as a foil for the two German Scharnhorst class cruisers. I may add some later armoured cruisers to the Royal Navy and perhaps a brace of modern light cruisers. The bases for these models are currently on order as are the flags. Whilst I am waiting for them to arrive I can give some thought to the livery of the ships in question - do I go for China Station/Tropical White or should I go for the more practical overall grey? At this stage I am leaning towards the overall grey simply because I will be using the ships for actions set during the Great War as well. In any event I have a few days to decide. The blocks revisited. For the key units of infantry, cavalry and artillery I have added a black and a white band. Black is intended for use with elite or 'heavy' types whilst the white is for 'light' types. the white band on the artillery block will also be used for horse artillery where there is a distinction between foot and horse. In my previous post I mentioned that I had been revisiting the block armies with a view to using them in action once again. I also acknowledge the problem of following the action using them unless the narrative (and photos as well) is more closely aligned to what was happening on the table top. I had forgotten o mention though that after I had last used them I actually went and produced some additional types - with the intention of making identification a little less problematic when in action. I am planning on producing some national flag blocks to work with the command block (the one at the top of the picture above) which will also give a better sense of nationality. One could be forgiven for thinking that the sole reason I have gone to this trouble is merely to produce better, more viewer-friendly after action reports for the blog. This is partly true but it is also to address a need from a personal perspective. Having some variation within the same notional troop types makes the units more obvious. Rather than just throwing an action together I want to spend more time in developing the back story and adding weight to the after action report so having units blocks that are more easily identifiable makes a lot of sense. A long time ago in a loft far, far away...The original full sized blocks (I still have most of these) in use on the Axis and Allies maps. The action is a Napoleonic 1815 inspired engagement in Belgium. The game is in the Games folder but you can find it here should you want to read it. One of the early decisions I took in respect of the block armies was that they would be used a test bed for various periods so I could fight actions prior to investing monies and time with painting etc. Since I have had the blocks the only painting I have tackled to any great degree has usually involved ships, other than the odd experiment with figures. I have a number of figure based projects to undertake ranging from 1/600th or 3mm up to the 54mm Sons of the Desert set up. However, first of all I need to get some ships painted which fortunately I am able to do fairly quickly using the famous 'Gow' technique. Of the figures themselves the 1/600th kit will feature first, mainly as I can get them painted and ready fairly quickly as well. 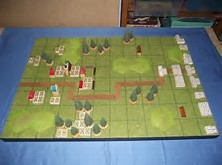 The blocks in their current iteration in use with the Portable Wargame (actually an earlier pre-publication version) rules. So what does all this mean in the short term? Well, I shall be dragging the block armies out again and plan on using them in two similar ways. I will be making use of my Heroscape terrain with single blocks representing units and counters for hits suffered and I shall be using my Axis and Allies double sided and laminated maps with more usual Command and Colours/Portable Wargame sized units (the famous 4 infantry, 3 cavalry and 2 artillery standard). One of the issues I have faced when using the block armies in the past is that the games can be quite hard to follow after all, one block looks very much like another. I have certainly been guilty of not giving sufficient back story to support the unfolding action in the past and having read some of my older posts can only agree with observation! When used as a '3D military map' it is important that the narrative supporting the pictures is relevant and provides the reader with the information they need to follow the action. When reading about a battle in a book for example, it can be frustrating if the text does not support the map at a given point or even vice versa. As a game should be a dynamic event it means that even more care needs to be taken to ensure that the action can be easily followed and, more importantly, impart a real sense of flavour for the period. With this in mind I shall be embarking on some new games (not before time as well!) but with a much tighter narrative to support the action. Some of my previously recorded games followed this approach quite closely and so made for a much more entertaining read - I am not talking about the 'purple prose' here - but the overall quality was very uneven. Oddly enough some of the least interesting games to play actually read quite well. I enjoy writing but like everything else I do I am notoriously 'short-winded' and have an attention span that can best be described as variable. I need to ensure then that when I fight a battle I need to spend time properly preparing it and making sure that the action is clear and easy to understand and above all, entertaining. Back in the 1970s following the conclusion of the legendary Madasahatta campaign organised by Eric Knowles I was fortunate enough to have been asked to take part his next project. This was a naval campaign set in South East Asia starting at the outbreak of the Great War using 1/1200th scale ships and with a modified version of Fletcher Pratt being the rules of choice. I say modified because the actions were fought on an 8ft by 5ft dining table with movement distance being in the order or roughly 30 kts equalling 12" or thereabouts. Time has dimmed the memory of how the campaign ran on a blow by blow basis but a few of the highlights have stayed with me. The navies of Great Britain, Germany, USA, Russia, Japan, Austria, Italy and Turkey featured and yours truly was given command of the Turks - a decision which has led to my lifelong interest in the martial history of the Sublime Porte through the ages. As a young and experienced naval wargamer I took my new command very seriously and immediately besieged a local reference library for any copies of Jane's Fighting Ships. I was able to photocopy the complete 1914 Jane's entry for the Turks and set about producing the requisite models. I scratchbuilt the battle cruiser Goeben and light cruiser Breslau as well as the two protected cruisers Hamedieh and Mejidieh whilst the rest of the fleet came from a variety of sources. The old ironclad Messudieh was represented by a Mercator model (or it may have been Navis) of HMS Nile and the two old German pre dreadnought battleships Brandenburg and Worth were converted from a Minifigs Iron Duke type dreadnought with a couple of turrets removed (bear in mind The Minifigs ships are 1/1800th or thereabouts so are smaller than the preferred 1/1200th). Mention of the these two venerable old German warships is the main raison d'etre for this post for reasons which will become clear in due course. Suffice it to say that during the aforementioned campaign they were surprisingly effective as both were generously armoured and had a useful main battery of 6 x 11". At the time we fought the campaign no allowance was made for the types of armour used nor of such consideration as length of guns barrels being used - two of the Brandenburg's 11" weapons were short barrelled so had a lesser range (think of the 75mm gun used on the Panzer 4D as opposed to the F2 version for a similar comparison). Looking back the campaign was a lot of fun but if I am honest the rules really did not work on the tactical side but as we were all under the same handicap it did not matter. If I were to do the same again though I would happily use Fletcher Pratt rules on a table top but with smaller models instead. Many years after the end of the campaign I raised the Turkish Navy again - this time in 1/3000th - along with the Greeks, Bulgarians and the Black Sea Russians. I fought a number of actions with these models (they posts are in the games folder) but something was not right about the scale. I think for me that 1/3000th as a scale is better for actions where the models are larger which means dreadnoughts etc. As ships tended to be larger in WW2 I think this is where it comes into its own. 1/3000th scale pre dreadnoughts now seem too small for my taste - perhaps it is an age thing. 1/2400th is a different kettle of fish though as the extra size makes for models that have greater presence on the table top. I have flirted with this scale for the Jutland project and it was a revelation for me as to how much better the models look when deployed. The problem though is that there are very few UK manufacturers in this scale meaning using imports from the US - GHQ and C in C being a good examples or even Panzerschiffe. An honourable mention could also be made of Shapeways or the War Times Journal. Anything from the US invariably means high postage and possible customs charges - all of which add to the cost. Now lets be honest, GHQ and C in C models are beautiful. They are highly detailed and to my mind are more models than gaming pieces. Panzerschiffe are at the other end of the scale and are more gaming pieces than models - each have their advocates. For my taste the GHQ models are too good to be used for gaming - there are far too many small parts that will either fall off or break under the stress of heavy handling during a game. Again, just my opinion. They are also pretty expensive when you are looking at raising large forces. As an aside a chap in the blogosphere raised the forces for Jutland using GHQ models - they looked superb. Luckily help is at hand. 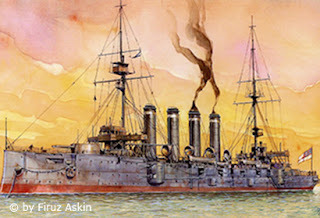 Tumbling Dice: Age of Battleships is a range of models for the pre dreadnought era that cover at present the Russian, Japanese, Spanish, American, British and German navies with the Austrians and Italians to follow later this year and the French in 2018. There is also a very useful selection of assorted merchantmen (aka targets....) for the period. With the recent release of the Germans for the period I took the plunge and acquired some RN and German types - notionally for overseas use rather than the Home Fleet. Paul at Tumbling Dice has produced some discounted starter sets which I took advantage of. Essentially I have two of the China Station RN packs and some extras (including Triumph and Swiftsure) in the shape of cruisers and destroyers and for the Germans I have the East Asia Squadron (the 1914 version) plus the earlier Boxer Rebellion East Asia force. Guess what? All four of the Brandenburg class took part in this so the Germans now have a quite healthy force - especially as I have also added some destroyers. I will post some pictures of the models in due course as they are very nice indeed. I would describe them as being detailed but not to the GHQ standard which means they are far 'safer' to use for gaming. This is not in anyway a criticism though! They are quite reasonably priced and the number of parts that require assembly is limited mainly to funnels and military masts. Take a look at the Tumbling Dice website and you will see some pictures. Of the Brandenburg models themselves they are really quite delightful and I shall enjoy using them in due course - with the armour and main guns properly accounted for naturally! The indefatigable David Manley has done it again. 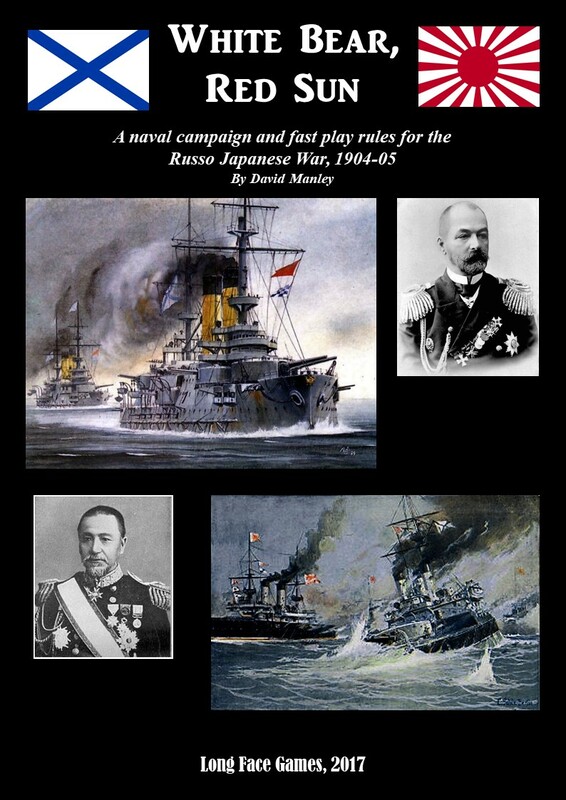 This time he has turned his attention to the Russo-Japanese naval war of 1904 to 1905. The rules are available as a download from the Wargames Vault and they are certainly worth the money! Aside from a potted history of the naval war the book contains a fast play DBA inspired set of rules and a complete campaign system including maps and counters. the rules are very slick and represent the culmination of some 20 years of research and testing so you can be sure they work! I have a passing interest in the war (I have a couple of titles in my library) although I cannot see myself raising the fleets for this BUT the rules are eminently suitable for the 'pre-dreadnought' era in general. Looking long and hard at the 1/2400th scale range produced by Tumbling Dice (which include Chinese, Spanish, American, Russian, Japanese, British and recently the Germans) one can see where my thoughts may be headed. Austrians, Italians and the French are due over the next six months or so so the range will be very impressive. The models are very nice indeed. My plan (and indeed, the models are on order) is to raise a British and German fleet based on the China Station and Red Sea/Indian Ocean squadrons for the Royal Navy and the East Asia squadron for the Germans. Conveniently Tumbling Dice produce discounted fleet packs for the China station and east Asia squadron so it was merely a matter of fleshing these out. I was delighted to see that the Germans made a considerable naval effort for the Boxer Rebellion and sent all four of the Brandenburg class battleships and assorted cruisers etc. In the background as I envisage it these will be present and then reinforced by Graf Spee's command. The Royal Navy will gain some bits and pieces but for the most part will be at a slight disadvantage although they will have numbers. I should also mention that they will get Swiftsure and Triumph to negate the Scharnhorst and Gneisenau. The great thing about naval games is of course the fact that not only do you not need much material for a good game but also the forces are quick and easy to get ready. It will give me something to paint whilst the 54mms are being organised in any event. In my previous post I touched upon the latest bout of wargames insanity I have embarked upon, namely the French Foreign Legion circa 1900 and their Tuareg/Berber opposition. I also mentioned that the figures I am using are from Armies in Plastic in 54mm. With this in mind I thought it would be a good idea to show you what he figures look like. Of the 10 poses you get in a box of 20 figures here are 9 of them. The missing pose is laying down firing - a position I will not be using. The selection of poses in quite sensible and I have sufficient figures to be able make some uniform units. Again, there are 10 poses in a box of 20 and here are 8 of them. I miscounted when I sorted the figures out so there will be a single usable pose as yet unseen (I will post him when I have found him! )- the other is of course the laying down firing position. Berber tribesmen typically wore a full face wraparound veil unlike the headdress usually associated with Arabs so this set is a little bit of a mixture as the rather natty looking command type (bottom row on the right) is wearing a more usual 'Arab' dress. I will make use of him though as he is rather a splendid fellow. The rest have a selection of firearms and hand weapons - enough to satisfy the most belligerent tribesman. I also have 10 mounted Arabs which I will unveil in due course - they also have the mixed headdress issue. As far as painting is concerned these will be getting a flat finish and will also be gloss varnished. I need to organise some bases for them which is complicated slightly by the variety of base depths. Infantry will have a 3cm frontage with depths to suit. The mounted figures are on uniform bases so will be easier to tackle. As they will be based individually I fully intend using the figures with The Men Who would be King as well the Portable Wargame. As far as unit sizes are concerned I am considering wither 12 or 16 figures for infantry and 6 or 8 for the cavalry. Artillery will be a gun and three crew. I offer no apologies for what you are about to read and I suspect that most people that know me well will not be in the least bit surprised. Following on from a very enjoyable and inspirational Funny Little Wars game - the famous Leipzig on the Lawn - I have had occasion to think long and hard about my gaming (or rather lack of) and how I am going to tackle it. I have settled on the rule systems I shall be using - primarily a Portable Wargame/Command and Colours/Morshauser based hybrid of sorts - and also the scale for what will be larger actions - namely 1/600th or 3mm. Now lets be honest, as a scale 1/600th is hugely practical but for me is very much an extension of my block armies as the size makes for very easy painting and works well with Heroscape tiles. In effect I shall be using these models instead of the blocks for the look of the thing - as is only right and proper. That is all well and good and eminently sensible but hardly a visual treat. Other scales, which in this context means for me 15mm through to 28mm, I seem to have real problems with - usually because of the number of figures I would need to make it look right. I like units to look like units which means in the earlier periods tends to mean using a lot of figures - which in turn means more painting etc, etc, etc...It is very much a personal conundrum. I read somewhere that a lot of the games you see in the magazines these days (I cannot claim to know for sure as I no longer buy any) tend to use a small number of figures - almost skirmish level in fact. I have said in the past that I am happy using a gridded playing area and so using the above rule systems or variants thereof is quite a natural thing and I am well satisfied. However, using figures is the ultimate aim and so using models that will give the visual appeal I want with the limited numbers I want to paint means that a smaller number of larger figures is in order. I suspect you can see where this may be heading. Using a 6ft by 4ft playing area with 6" squares will comfortably accommodate larger scale figures on the 4 infantry, 3 cavalry or two gunners and gun basis. By larger figures in this case I mean of course 54mm. So here is how it goes. Inspired by the aforementioned Funny Little Wars Leipzig battle - especially the use of 54mm plastic figures painted in an old school fashion - I started to think about using such figures on a 6ft by 4ft table. Initially my thoughts headed to the North West Frontier circa 1890 and the range of figures produced by Armies in Plastic. You may recall the Roghan Valley (there is a folder with the posts associated with it) so revisiting seemed like a good idea. After all, there would be plenty of colour and flavour. I even have a modest library covering the period from 1878 to 1935 so there was little excuse not to think seriously about it. However, I was thrown a fairly substantial curve ball in the shape of rather a lot of plastic 54mm French Foreign Legion and Berber Tribesmen - not to mention a fort - for a very attractive price and so I took advantage of the same and am now the proud owner of some 200 plastic 54mm figures from Armies in Plastic plus their rather splendid Fort. After some experimentation on my 6ft by 4ft table one is easily able to deploy two reasonable looking forces without the table looking too cramped. On a non grid based basis and assuming a 12 figures infantry unit deployed in two ranks (covering an area of, for example, 18cm by8cm) one can happily use around half a dozen or more units at side - which is not only suitable for the Portable Wargame but also things like The Men Who Would be King. There is s a lot of potential for sure. As it stands then the plan is to raise a couple of Portable Wargame sized forces circa. 1900 for both the Legion and their erstwhile opponents, the Tuareg or Berber tribesmen. Although the latter are described as Arabs they are dressed in North African garb rather than Arabian but would also be suitable for use as Sanussi tribesmen for the Great War or even for use against the 1930s Italians. 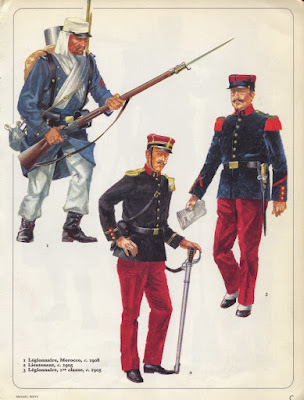 The Legion infantry can be supported by the use of the Colonial pith helmet wearing British with a suitable paint job - which would also apply to the artillery and gatling gun available from the same source. In fact the only real shortage are camels and mules but I plan to source some of these as dismounted markers of some kind. Certainly something else to think about in any event....particularly as it would open up the naval dimension which is ordinarily not what one thinks off when discussing the Foreign Legion. There will be other blog posts about this epic encounter together with some rather better quality photographs of the fun but I wanted to write about the game from a rather more personal perspective. I was supposed to attend a similar event at the same location and dramatis personae back in 2015 when a refight of Waterloo to coincide with the bicentenary was undertaken but sadly had to pull out at a late stage. I was taking no chances on missing out this time though and so it was I took part in a game that has made me look long and hard at pretty much everything I thought I knew about wargaming and how to fight battles with model soldiers. Allied cavalry supporting the Swedes under Bernadotte (Conrad Kinch) prepare to administer the coup de grace to the remnants of the Imperial Guard - but at a heavy cost. The battle itself took place over some 5 hours of game time and started on the second day of the actual battle. This meant that the allies were in contact with the far flung French outlying forces almost from the outset. The French plan was simple - wait until they were rolled over and then retreat with what was left. It succeeded rather too well and at the conclusion the baggage train and the imperial staff were last seen heading towards Dresden and a single unit of cavalry and perhaps some of the guard possibly following. In truth the French lost faster than the Allies won and at times one was almost reminded of the old arcade game Space Invaders. The game had everything - high drama, massed cavalry battles, furious melees and some very random shooting. Normal artillery was handled using the time honoured matchstick firing model - in this case a 25pdr - whilst for canister rounds good use was made of party poppers - which was enormous fun for all concerned! Camaraderie, good natured banter, lots of figures, good weather, great umpiring, beers, sandwiches, tea and scones and the chance to recreate in some small way a piece of history - what is not to like? Indeed, plans are afoot to conduct another game at some point next year and I only hope that I will be able to participate. For my own part one of things that came out of the affair was they 54mm figures - even with a simple, flat paint job (old school style) - look quite splendid when deployed for action. Now I am not saying that I will be going full on Little Wars but using a modest number of figures on a 6ft by 4ft table, probably gridded a la Cordery/Morschauser, would certainly look the part. Much to think about I assure but in the meantime a big thank you to Tim and PW for making it possible and all of the cast and crew - especially my two long suffering subordinates - for making the whole day a memorable adventure.